A load D of mass m, having obtained at point A the initial velocity v0 moves in a curved pipe ABC located in a vertical plane; sections of the pipe or both inclined, or one horizontal, and the other inclined (Figure D1.0 - D1.9, Table D1). In the section AB, a constant force Q (its direction is shown in the figures) and the force of the resistance of the medium R, depending on the speed v of the load (directed opposite to the motion) act on the weight of gravity. the friction of the load on the pipe in section AB is neglected. 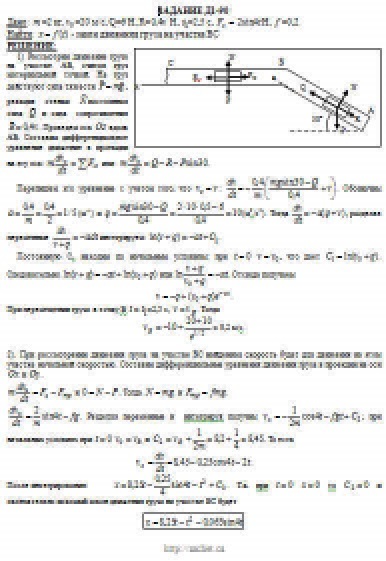 At point B, the load, without changing its speed, passes to the section of the aircraft´s tube, where it has friction force (friction coefficient of the load about the pipe f = 0.2) and a variable force F, whose projection Fx on the x axis is given in table. Assuming the cargo to be a material point and knowing the distance AB = l or the time t1 of the cargo movement from point A to point B, find the law of cargo movement on the section BC, that is, x = f (t), where x = BD.